Fashionable Asians! is Ricepaper’s very first street fashion series on…fashionable Asians in Vancouver. Unlike any other street fashion blog, however, we seek to find out the deeper meanings behind these fantastic outfits. Is your outfit saying something about your cultural identity, your mood, or the weather? What can we learn through the fashion of trend-trotters walking down the line between one home neighborhood and another across the Pacific? I was working in the Ricepaper office one Thursday afternoon when a volunteer stopped by to pitch an idea to Kristin (Managing Editor). That volunteer turned out to be Momoko, whose subtle and distinct style prompted me to ask if I could interview her as our first Fashionable Asian. 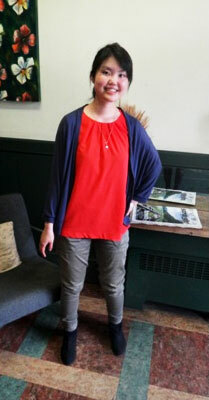 Momoko shows off her bright orange shirt, eye-catching in the midst of her other subdued, earthy style choices. So, tell us about what you’re wearing today. M: I’m wearing this bright orange shirt that I got at a consignment store. It’s originally from Aritzia. It was really cheap! It was $30 dollars. And I know neon orange is a pretty trendy color these days. And it’s pretty cold today, so I wore boots with a cardigan, just to keep myself warm. I love navy, and I love the combination between navy and orange. I especially really like your pants! M: Oh thank you! They’re from Japan. Oh really? Where are your boots from? M: They’re from ECCO, a Canadian brand. I made this necklace myself, and this cardigan is actually from Japan as well. Wow! It’s like your outfit is 50% Canadian and 50% Japanese! M: You’re right! I guess it represents who I am. M: I base a lot of my clothing choices on comfort. My friends always tell me that I dress really Japanese. But I think I like to dress more “Western.” I like pants and boots, and I don’t really go for Japanese-girl skirts and cutesy little shoes. I’m all about casual comfort. I can see that a lot of your choices are based on the Vancouver weather then. M: Yes, it’s pretty hard to be stylish in all this rain and cold. But I’m trying to find that fine line. Would you wear this exact same outfit if you were on a trip to Japan? M: Good question. I feel like I would choose a more girly outfit. You’re free to be more cutesy with your choices, since all the girls wear dresses there. Momoko describes her outfit on the Ricepaper couch. My interview with Momoko confirmed a hypothesis that inspired the production of Fashionable Asians! in the first place. Lots of things influence our clothing choices, from what we see out the window in the morning, to the impressions we want to make throughout our day, to the form of transportation we are planning to take. When applied to the imaginary space between one geographical location and another – in Momoko’s case, Vancouver and Japan – these choices are also driven by a personal preference that has been influenced by multiple streams of trends. Choosing to lean towards one stream of trends over another, or maintaining a balance between the two, prompts us to consider ourselves and others as less “this” or more “that” – really “Japanese,” or more “Western,” for example. They say that we are what we eat – are we what we wear? Or vice versa? What does your outfit say about you today?